It won't have a VIN, just a chassis number which is usually stamped into the chassis rail near the n/s/f spring hangers. Might be hidden under paint. This on my behalf Trevor? I'm led to believe that she started life as a Leopard, well, the front half anyway. What happened to the photo I was looking at a few minutes ago? Rebody ex UTA 3571 (PMC body) - chassis extended with ex UTA Worldmaster 3366. 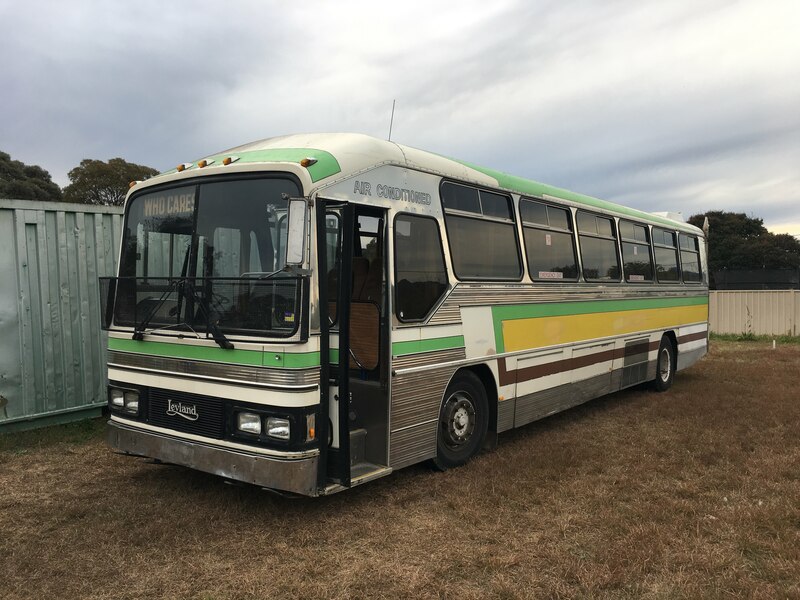 Sold to the Church of Scientology as YZJ 151 - Repowered with a Leyland TL11 engine and rereg AI35NT. I dont have the chassis number of the Worldmaster of ex UTA Worldmaster 3366 which was used to extend it. I know what the chassis number is. The problem I'm having is the physical location on the chassis. I've crawled all over underneath it and can't find it, and I'm hoping on the longshot that somebody here might have worked on the bus and can point me in the right direction of where it is. Here's a photo of the old girl. She's on airbags, at least two each side in the rear, and I think two each side at the front too, with independent height control valves.